I love football. I love chili. Yet I never posted a chili recipe for the Super Bowl. That's just wrong. So today I'm making up for it with my healthy, kickin' chipotle chicken chili. Chili is the perfect belly warmer on a raw March night. 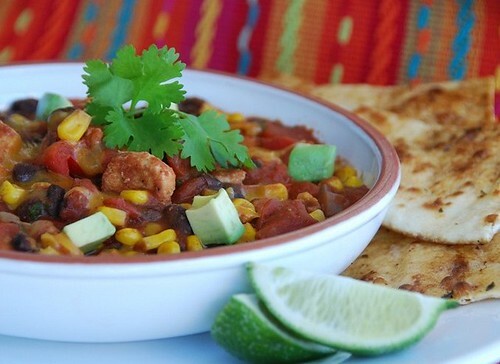 And this chipotle chicken chili will warm you from the inside out. It's tantalizing aromatic, sweet and spicy, creamy and rich, and --this is the best part -- it's healthy. Packed with lean protein and fiber rich beans and corn, this chili is filling without being fattening. Plus tomatoes and red bell peppers provide antioxidants which may just help you feel healthier too. Now who could complain about that? Enjoy rich and spicy chili without the guilt. This chili is packed with lean protein, belly-filling fiber, and antioxidant rich tomatoes and red bell peppers. It's even better with warm and crispy spiced tortillas. In a large pot over medium-high heat, warm canola oil. Add onions and saute until translucent and lightly browned, about 5 minutes. Add chicken and saute until lightly browned, about 10 minutes. Add red bell pepper; cook for 5 minutes. Add corn, beans, tomatoes, lime juice, brown sugar, and chipotle chilis in adobo sauce; stir well. Reduce heat to low; partially cover and simmer for 20-25 minutes, or until desired level of thickness is reached. Cook longer if you like your vegetables softer. Stir in the fresh cilantro, and adjust seasonings to your taste. Top individual servings with diced avocado, chopped fresh cilantro, shredded cheese, and a dollop of sour cream, if desired. Leftover chili will last up to 1 week if refrigerated in an air-tight container. For the spiced tortillas, place a large non-skillet over medium-high heat. Spray both sides of a tortilla with cooking spray and sprinkle with spices. Place in the hot pan for about 1 minute per side, or until crisp. Repeat with remaining 3 tortillas. Cut each tortilla into quarters, and serve alongside bowls of chili. *Note: This is a rather soupy chili. If you prefer a thicker chili, then use fewer tomatoes; if you prefer it really soupy, then add an extra 1/2 cup water. **Chipotle chilis in adobe sauce are available at Mexican specialty markets as well as in the Mexican section of most major supermarkets. If you can't find them, then substitute 2 tablespoons of chipotle chili powder and 1/2 teaspoon cayenne pepper. Taste and adjust accordingly. mmmm that looks REALLY good! I really like a good chicken chili - red or white. I'll have to try this one. I love to make chicken chili, it's just a nice change from the regular beef chili. This one sounds great and the seasoned tortillas are a wonderful idea too. sounds delicious! i just love chili, and also agree the best part of it is that it can be so healthy! i hate the ones that are just pounds of beef - I really like adding lots of veggies, beans and other good stuff to chili. so many flavors! yours looks delicious! I love chicken in chili but I've never tried chipotle! Sounds great and I agree, perfect for a raw March night. i really enjoy a good chicken chili however sometimes it does get to be on the dry side. this looks lovely and colorful and i am sure the smoky chipotle flavor brings out the best! Mmm, I love making healthy chilis. They are so satisfying and warming. I love to add a bit of pureed pumpkin to mine. Looking at these pictures, I know your chili is a recipe I've got to try. It looks oh-so-good! I really dig this Susan. This chicken version is more like what we'd like. I've got to try this soon to get my lad to eat some beans...YUM!! Considering that we have got a few inches of snow last night - this chili is sounding right up my alley! I've loved your chilis... I think I may try this in the slow cooker so my meat will end up shredded (i.e. not as pretty as yours) but I bet still delicious. YUM! Wow, what a great recipe, and on the day of what the Weather Channel is calling the winter's worst storm. Are you psychic? We all seem to have a version of chicken chili. Yours looks awesome. I love the idea of adding chipotle chiles, they have a subtle smokey-type flavor that I imagine is great with these other ingredients. Looks delicious! A perfect dish for the chilly weather we're having here. I love those chilis in adobo sauce. I pop them in lots of things! This is the kind of chili I like. I'm "clipping" this recipe. I love chili and I love this recipe that you shared in your site.Looks so easy to do and so easy to finish everything after cooking. I am a fan of all things chipotle. This sounds so cozy and yummy! This sounds so delicious Susan!! I love the idea of the crispy, seasoned tortillas with this chili. It all sounds fantastic!! I have never tried chipotle but the whole dish looks beautiful with all those colours and very healthy. I'll be trying this soon! I looks so fresh and healthy, not to mention delicious! Perfect for a rainy day - now I know what to make for dinner! Really like your idea for spiced tortillas! katie-Thanks! I'm glad you like it. heather-Comfort food that's healthy. You just can't beat it. maris-It really makes the dish. meeta-Yeah, I can see that since it doesn't have the fat of beef. elyse-Pureed pumpkin. Yum! I make a pumpkin and black bean veggie chili, but I should try with the meat too. kara-I love when it's all tender and shredded. Mmmm....good. melissa-I've got to see some of the other them. michelle-You can never have too much chili. italian dish-Yay! I'm happy to hear that. cabotjen-I just love the tortillas all by themselves! ivy-It's a singular flavor that I just adore. lynda-I hope you enjoy it. I love your healthy recipes. You are so inspiring. Susan I have something for you. This is so good, and really the perfect type of pantry meal, since you can keep so many of the ingredients on hand. Chipotle is just the best! So sorry Susan, some of my rss feeds have been misbehaving lately and yours seems to have been one. I've refreshed it. Love this chili with chipotle and cilantro and black beans. The last one I made with homminy instead of yellow corn for a change. This looks so fresh, healthy and delicious! I never had chicken chili and we love chili here... thanks for this recipe! tw-I just love it in so many dishes. cris-I hope you give it a try then.